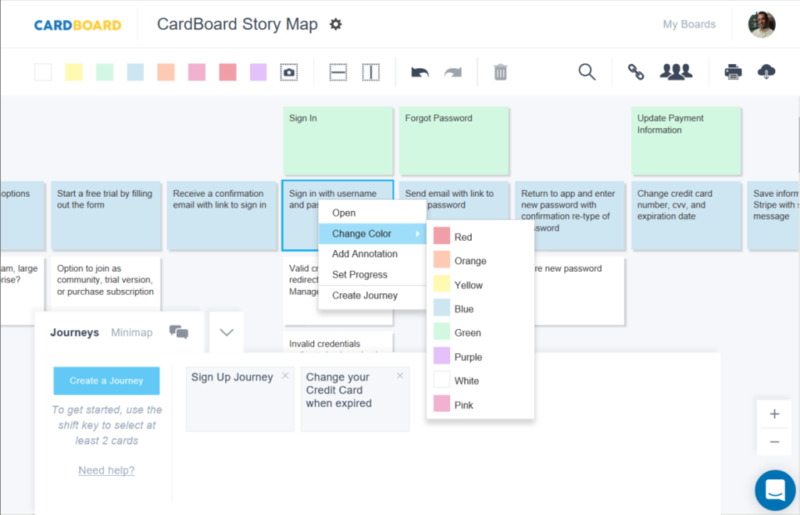 CardBoard is the world's #1 user story mapping app. Collaborate with you team in real-time even if they are scattered across the globe. 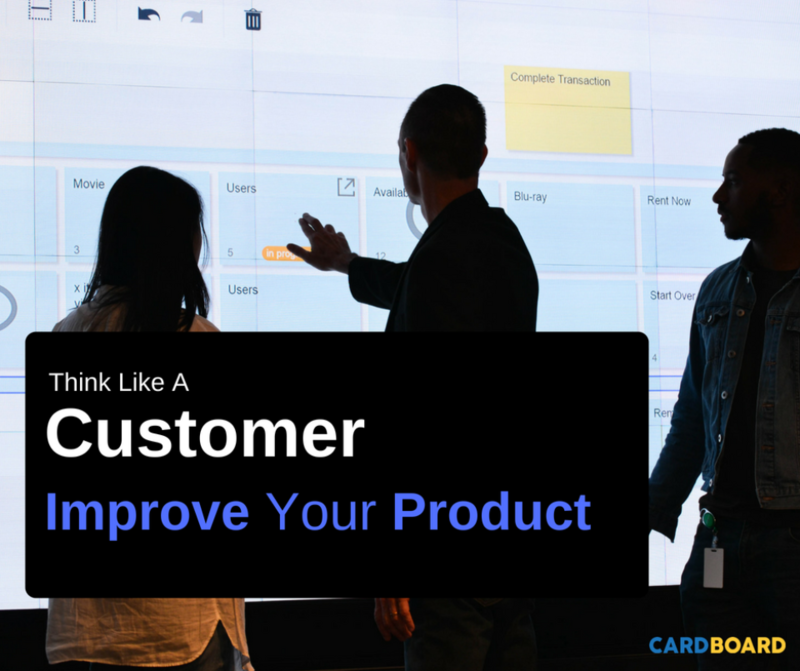 Easy to use and helps team build products that customers love. Sync your boards with tools like Jira, TFS, VersionOne and Pivotal Tracker. Your boards stay up to date whenever you make a change. See what you have been missing and try CardBoard. Pros: * Very easy to start using it. After you get yourself familiar with the Story Map Concept and sign up for CardBoard, you can start doing the mapping exercise in no-time. Overall: I've become interested in product management and read about User Story Mapping technique. Then I googled for a story mapping software and that's how I got to CardBoard. I tried it for a few of my own projects and it worked nice! I was able to create a visual backlog of things I had to do, and track my progress against the backlog. Everything was very transparent and easy to understand, so I highly recommend learning Story Mapping and trying Cardboard to everybody. 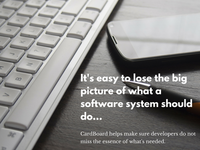 Pros: The software simply and quickly allows us to build the framework (skeleton/backbone) of the business process and how technology supports through through the power of cards. Through this process we able to quickly understand our knowledge gaps. The journey feature also provides focus during deeper discussions. Cons: Most of the quirks were address in the latest update (biggest being the introduction of colors and new layouts). However, we still struggle with the printing capabilities and how if needed we need to share in a planning session. Overall: Overall, this has changed my teams approach of how we work with the business! It is a great interactive tool and our business stakeholders love walking through the roadmap and scope in this collaborative tool! Pros: I learned about CardBoard from book, User Story Mapping. I so wanted this to be more, but it's a basic implementation of story boarding. It did have TFS integration, which I wanted. I also loved the whole premise of a virtual board for doing story mapping with a remote team. Cons: I found it to be too basic and not very imaginative in its implementation. Given that we'd want to use it with multiple stories and have one place, I felt it didn't give us the tools to do that. Overall: Anyone who has read the User Story Mapping book gets why a tool like CardBoard is great for doing/saving story maps. It did install easily and I got started quick enough. In my searching/research, I eventually came across StoriesOnBoard, who also follow the tenets in Patton's book. However, they clearly have the imagination to take it further and built in better tools for managing multiple stories, etc. We ended up choosing SoB, despite the fact that (at the time) they didn't have TFS integration. And while this wasn't a factor in my decision, the CEO himself did a late night (for him, in Europe) walk through demo with me to answer some of my questions. Pros: I quite liked the intuitive interface and ease of storyboarding things. Cons: The JIRA integration left something to be desired. The software did not do a good job of informing me of what it would do when I synced the two. It was also not clear to me that this was not a constant sync. Changes in one product were not automatically migrated over to the other. This was especially problematic because later syncs of the stories and epics caused duplicates of the previously synchronized items to appear because the system did not identify previously sync'd stories. Overall: I found the software quite useful for basic storyboarding and brainstorming new projects. Unfortunately, due to the limitations of the JIRA integration and the nature of the work I'm doing, it just wasn't useful for anything other than large/complicated projects that need a fair amount of planning and it could only be used in the initial stages. Once I had the list of story "slugs" it was better to manually migrate the list over to JIRA and cease using Cardboard. Pros: The simplicity of the tool, it provided me with what I wanted and did not over complicate it with features I did not need. Cons: The export to excel option was pretty messy, but then again why export it? Overall: I stumbled upon CardBoard a long time ago (2011) when I wanted an easy way to capture a Story Map. I really liked how easy it was to drop cards, move them around, and add some comments. The Team really enjoyed the look and feel of it. It did what we wanted and nothing more. I'm not a heavy user of it, but when I do need to put together a Story Map, CardBoard is what I turn to. Pros: Web-based, so it's everywhere you need it to be. Cons: I would like a project-based pricing model, rather than a community one. Sometimes what I need is one board for a group of people who will never work together again. Overall: We use CardBoard for release-slicing and roadmapping, as well as for the overall purpose of user story mapping. It plays well with others and is easy to use. Software that is this well-done is extremely hard to find these days. I highly recommend this software. Pros: Do story mapping workshops having something similar to sticky notes, if teams are not co-located (which is the best, but not always achievable). Even if local parts are done in analog way, we transform it to cardboard in order to keep the high level overview and be able to tell others the "the story" in order to get them involved. did not found anything else so far providing same experience working with sticky notes, for mixed teams (co-located and not). Pros: The application is intuitive and it's very easy to demonstrate the importance of technical debt to stakeholders. Cons: The export capability is limited. The description of the cards can not be exported without printing each card individually. The board view PDF export is not as user friendly/aesthetically pleasing as the actual application. Stakeholders are asking for PDF exports, however, I hesitate to share due to the aforementioned reasons. Overall: The tool is great for presenting the roadmap to leadership, stakeholders, and Engineers. I would highly recommend it, however, would also suggest getting enough licences for all folks on your team due to the limited export capabilities. Pros: I love that this is very simplistic. Story mapping shouldn't be complicated. This software is exactly what you need to map out your next project. It allows for easy collaboration with your team. You can leave notes on tickets. You can easily change the color, had swim lanes, add sections for V1, V2, ect. If you're looking for an easy tool to easily digitize your next story map, this is a great choice. Cons: There are a couple funny UX things that you'll realize really quickly and figure out how to accomplish that task. Specifically around moving cards and making mass changes. Overall: I've built out hundreds of mappings using this tool and never run into an issue. Pros: It's great to have a way to keep your sticky notes in an electronic format versus on a wall falling off after a few weeks. Cons: The copy paste functionality is horrible. Previously, you could copy a series of cards and then paste to quickly create different use cases/jouneys in the same board. It would create a copy directly over your original layouts. You could then move the duplicates where ever you wanted and quickly update. Now, when you paste, it shifts everything down and I have to spend 10 minutes shifting individual cards back up. That's my only main problem with the tool. Overall: I've been using it for years. It was probably one of the first electronic story board mapping tools available. It now has a different UI with added bells and whistles. I don't necessarily need them all, but it's nice to see that it's being improved. Pros: The service is pretty intuitive with a mostly point/click and drag/drop interface. It's easy to change colors and otherwise notate special things about the individual items. I also enjoy the ability to "flip" them for additional info while keeping the face "clean." Cons: It's hard to really get in and kick the tires with the free account... there was initially no option to make your trial boards private, so you either had to be perfectly comfortable with anyone in the world seeing what you're testing, or you had to try to test how well this will work for you using purely hypothetical situations. That's what I did, and I found it was very difficult to decide to pull the trigger for a paid account when I couldn't really use it accurately during the test drive. Seems that they have since allowed you to "upgrade" to a 30-day trial account before paying. 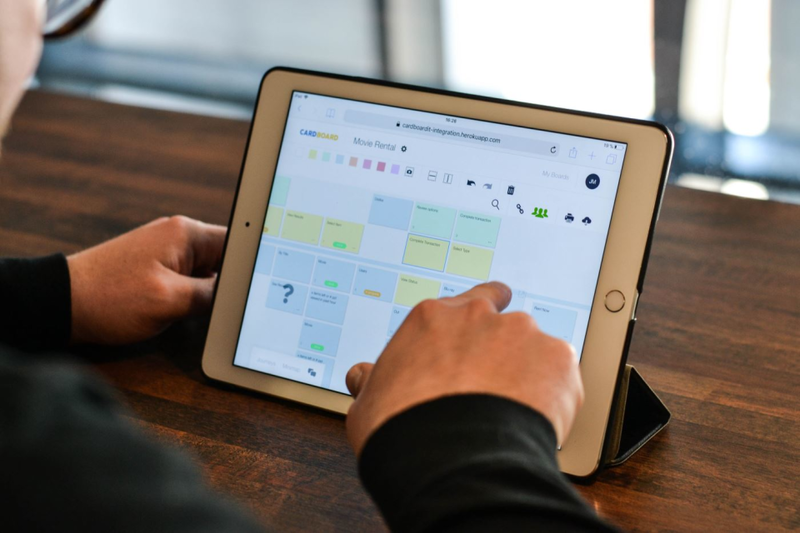 Pros: While working with paper and stickies is the most quick tool to adopt, sometimes a digital one is required, as it provides certain benefits (quick editing; sharing; remote collaboration). Cons: The free version is said to work like the GitHub model - all boards are public. Everyone can see them and browse them. So far so good. However, unlike GitHub where you can use one of several ways to get your repository to other people (sharing a link, inviting them, telling them the name of the repo...) I didn't find any of it here. I could not share the free board to my colleagues (even for viewing). There is a workaround with exporting, which can get the job done. Overall: It's a useful tool which gets the job done. You sign up, and create a board without even thinking about the functions. It's that easy. Especially after they updated the interface. Keep in mind the tool is more in the freeform category - you can place anything anywhere in a grid - it won't require you to put specific things in specific slots. The drawback of it is that while it is comfortable, it can't fully integrate with task/issue tracking tools. Pros: CardboardIT is extremely easy to set up and get going with. I had my first board running and doing real work with in minutes. There were many examples of other boards to get ideas from but this is so easy to use you really don't need much. Cons: There's not much not to like. It's straight forward and easy so I never had to call tech support or even consult the help file. Overall: I used CarboardIT to map out the product a team was developing for a Hackathon. We had lots of ideas that needed to be agressive lying prioritized and then recorded for possible future development. The tool allowed remote members to get a view of what the team was up to and could have collaborated in real time if we needed. Pros: The best thing about Cardboard is that it offers other modes of use, e.g. integrating to JIRA or printing cards for real world manipulation. Overall: Electronic tools for story mapping are really hard to come by. Fortunately we have found CardBoard. Thank you for your review as we look to improve CardBoard! Pros: It's simple and fast. Very easy to create story maps, journeys, and it's easy to slice the map into different chunks. Cons: I suppose if I had to nitpick, a 'collapse' option for 'epics' would be handy, especially when you get into huge storymaps...although that would take away the free-flowing nature of the interface. Overall: I've used this to do live training on storymaps and it's flawless. In a world of bloated tools, this is a gem! Pros: Ease of use - the way that the cards just rearrange themselves. Being able to group quickly. Cons: 'Selling' to various bosses at different work places. They just don't seem to get it, even tho it's really cheap & wont make a difference to the budget. Maybe that's just an issue with me & the places I've worked. Overall: I've used it map out a the biggest project my old employer ever had. Also smaller components to describe it to customers, build with customers. I did a talk on User Story Mapping at an agile meet up & demo'd Cardboard to the group and it was really well received. Introduced my current P.O. to it after he did a map in Excel - he'll never go back, loves it but still trying to get approval for it. Pros: The learning curve was short, so picking up CardBoard and using it was fast. Creating cards and laying them out was easy. Cons: The cards, as displayed, were much too small. 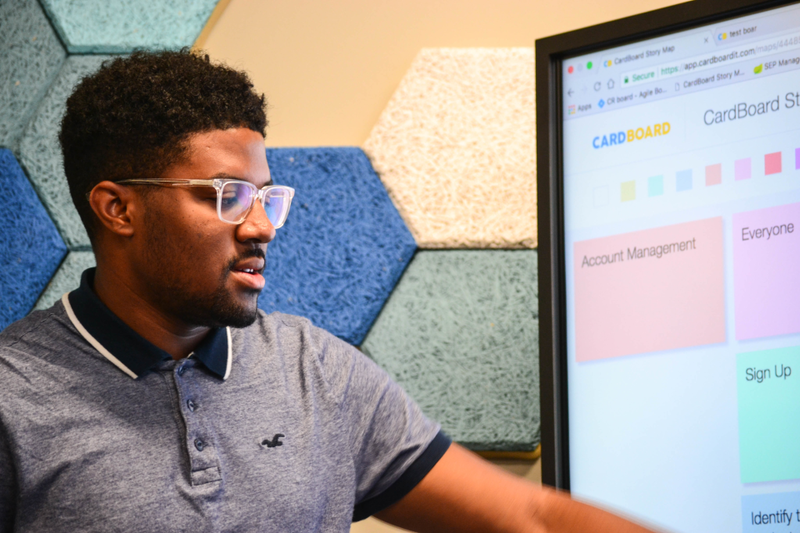 In order to even include all of the information that a User Story requires for one side of the card much of the text was hidden. The back was always hidden. The grid layout was much too rigid, I had hoped for the ability to overlap cards. If these features were present they were not obvious. Laying out cards initially was easy, but the UI resisted efforts to move cards very far (especially using a touch interface). If I needed to move a card to a different part of the board it was almost easier to delete and recreate it than move it. Overall: It was functional, but it felt like there were too many obstacles in the way to be an efficient replacement for index cards and a camera. I can see it being useful for other teams but not for ours. Pros: Cardboard is easy and simple to use. Doesn't take much to get up and running. Nice for sharing story maps with remote users. Great for small story maps. Cons: A little too simple. It becomes hard to manage with bigger maps. Thank you for your review, check out our updates in the coming weeks and please let us know what you think! Cons: The JIRA integration needs work. We use JIRA extensively, with multiple boards for various work streams. The integrator on the Cardboard side does not allow for customization over what is being pulled, and therefore cannot filter out technical tasks when I only want the user stories coming through. This needs to be fixed for it to get 5 stars. Pros: It's open ended with what I can do. I like being able to move the cards anywhere I want, the user journey functionality is a great idea, and it creates a good visual. Cons: The number one issue is the navigation and use of the software. Moving cards around quickly and moving around the board (especially when sharing my screen) needs a lot of work. If it the use of this software improved, it would be my main story board. I still use a physical board for working sessions because of this. Feedback allows us the opportunity to see what our customers think, and improve the process! Thank you so much for taking the time to review. Pros: I enjoy how easy it is to use. The dev team has integrated great features over the years. Cons: While a lot of the features are great. There are times I wish it just remained a simple light weight tool. Overall: I have found using the tool has been unrivaled when doing things like card mapping. I have also found it useful to use during retrospectives. Pros: I really like the UI and the ease with which cards can be created and moved around - two of the most important things in story mapping. I wasn't able to convince my Jira admin to set up the integration but from the videos I saw it looks to do exactly what I'm looking for. Cons: I didn't like trying to rearrange all of the cards when one card in a column pushed out a bunch of others. There was a lot of multi-select drag and dropping of all other cards to fill the extra column rather than it disappearing once empty. Overall: I tested a few story mapping tools and CardBoard came out on top in my tests. Just need to get budget approval now and I'll be able to start using it. Thank you for your review! Let us know if there are any steps we can take to assist you in the approval process! - When you move things cards do not reorganized as expected and we end to have to move many cards across the screen. I should not be forced to think in advance what to enter first to avoid delating and moving things around after. Pros: The software tools look modern and easy to use. I was able to get accustomed to the application with great ease. Cons: I think the application needs to have slightly more versatile for it to be used for a wider variety of reasons. Keep an eye out for the coming updates in the next few weeks! We believe it will make your experience much more versatile! 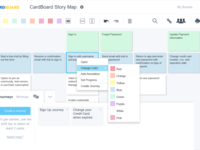 Pros: Numerous features to support multiple 'thinking-styles' when capturing the user story journey (colors, annotations, grid design, etc.). The integration with VersionOne was a key element for us when using any digital story mapping tool. Cons: Encountered a few bugs or hiccups when collaborating with remote participants. Overall: We used CardBoard for traditional Story Mapping exercises when building an initial product backlog as part of user story workshops. The need for this tool diminished as teams fell into a more regular backlog refinement meeting cadence. For initially decomposing epics/features into user stories this was a decent virtual tool for remote team participants. For co-located teams we find more tactical physical story mapping with sticky notes to be far more engaging. Pros: Love that you can now copy/paste within each story. Like that you can enter more information in the Description about the story and record Discussions. Pros: I like how you can do flexible user journey map using stickies. The multiple colours stickies are good for segregating the ideas and synthesise as and when required. Cons: Lack of templates is something that bugs me at times. With a tool like cardboardit people could cod what not and use it for what not . I think it's capable of much more. I would have loved it more if it had the capacity to save few things as preset and use it in future. Also, real-time collaboration is a missing piece as well. 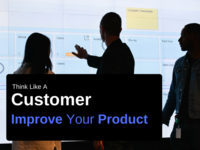 Overall: I like this tool, it's good starting point but there is multiple such tools available in the market which aligns with modern product development process. Thank you for your review! Keep out our new update that will look to solve the issue stated! Pros: Ease of use. There are not many tool that allow you to create story maps easily. Integration with Jira. Cons: Can't support/create complex story maps easily. Need the ability to resize cards. I'd be really nice if there was an ability to add markers on the card to denote additional info (add a round tag to the card and color it). Also, ability to format text on the card and a few words preview of description would be great. Overall: Experience was good. Wanted an online tool for story mapping. Ended up using Visio for now, but might use the tool in future. If you type into the card, three dots will appear showing additional information within the the card. Thank you for your feedback as we continue to improve CardBoard to make the best product possible for you! Pros: This is very easy to use. I enjoy the interface but there are some small hurdles getting set up. Nothing that would slow you down. Cons: The initial setup of the board is a little tough. It would be nice if there were more templates which showed different ways to use the software after picking a theme or something. Pros: Nothing comes close to this in terms of the flexibility and usefulness in helping virtual teams to story map. Overall: Support is always on the ball, and readily available to help. The app is great for what it's designed for. Pros: I loved how well it accomplished its core feature set. It was as close to the perfect solution to the kind of tool I was looking for for the specific tasks I was doing at the time. Cons: Unfortunately the price-point made it competitive with products like Mural and RealTime Board, both of which have a VAST array of features that CardBoard does not. If CardBoard offered feature-based pricing it'd win a lot of the time, but it simply can't compete with those other tools. So, if you're going to spend that much money, may as well get all those other features should you need them for other projects in the future. Overall: It was a great trial experience, and I loved playing with the tool. Just wish it wasn't so expensive. Specifically, I only need a couple of permanent licenses, but when I run workshops, I need between 5 and 50 people to be able to edit all at once, but only for a few hours. Sometimes, I need temporary licenses for temporary team members who'll only need to edit for a few days or weeks. Nobody has really cracked this pricing structure yet. Pros: Ease of use! It's very easy to create digital story maps. We use story maps for all our projects. Cons: - There's no ability to create folders. Since we create many story boards across the organization, there's no way to organize. Overall: It's been great so far! Love all the recent changes that were made too. Pros: It was quick and easy to pull a small group together to teach them story mapping through an exercise. Everyone was able to contribute right away. A few even loved CardBoard so much they kept building on the exercise, and demonstrating the product to colleagues. Cons: Would like to draw release lines that are snug to the user story cards by allowing the lines to turn vertically while going horizontally to indicate releases. Also, would like a way to keep top row in view when scrolling lower. Overall: Great way to organize project/product requirements quickly. Love that it allows multiple people working simultaneously. That's real collaboration! Pros: I didn't such software existed until I got to the agile world and someone invited me to CardBoard. My first impression was that it allowed teams to collaborate globally with ease. The cardboards are easily adjustable and organizable to however you want. Cons: In the beginning I was a bit confused on how the product worked given that I was invited or part of many different boards so it was a tidy difficult to access or find the board I needed to see. Pros: It was easy to start a board, create additional items in a flow, move them around, and the ability to add a point value to a square (story to my team) was fantastic! Cons: Sometimes when moving items, not everything was captured and had to re-move stories. 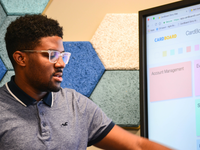 Overall: My team was able to visualize features broken down to stories in a PI (product increment), offering committed value to business, and giving the team a good idea of how our development work would be spread out over the course of eight weeks. Pros: It is very easy to use, the interface is great. Cons: Don't have any complaints. Perhaps having more colours to chose for the stickies. Overall: We were looking at creating a new applications and used CardBoard to develop and organize our ideas. Pros: We use Cardboard for our Scrum/ Kanban feature view of backlog and it's very flexible to use. We also use Pivotal tracker. The integration works like a charm !! Cons: Better look and feel. Dynamic multi person use at a time. Make it a collaberative tool ! Overall: Cardboardit was my favourite online post it notes but then I found Mural :) . It gave me much more than cardboardit. But that said , cardboardit was there when Mural wasn't and pioneered the way ! Pros: It is stupid simple. So easy to share with others, make changes, and easily add notes for a card that should be investigated. Cons: As storymaps get larger, navigation does get a bit tricky moving horizontally using the trackpad without triggering Back in the browser. Overall: We are trying to make a storymap interactive within the organization and it's been an effective tool where people feel involved with the decisions. Pros: I liked how easy the product was to use. Keyboard shortcuts made it a breeze to transfer my board to digital. Cons: I wanted to integrate with Microsoft products, specifically VSTS. Cons: Could have been user error but I experienced an issue with spacing. I couldn't easily manipulate full columns of tiles and experienced added space between columns that I didn't know how it happened or how to remove the space quickly. Overall: I used a CardBoard trial for capturing retrospective content in a visual way. I tripped over manipulating the content onscreen and the Excel export brought over content that I didn't need (maybe that can be tailored--not sure). Overall, I couldn't justify the subscription fee when I can use something like Trello for free. Cons: Needs more features, such as better TFS integration. 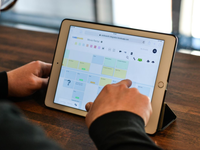 Overall: We were able to plan our projects very easily, without the tool getting in the way. Pros: I liked how it helped me spell out my user story maps and user flows without having to buy a huge whiteboard. It saved me space and time because of these reasons. I like the ease of use and how intuitive the software was. Cons: The pricing, I wasn't sure I would use it enough to make it worth the cost. If there was a unlimited free version that would give me one or two boards a month that would be nice. A great product if it's the only thing you were using. Pros: I liked that it was very easy to use. Almost everything was very click and drag, which made it really easy to onboard new users who were new to story mapping. I also really appreciated that it let me share a story map across multiple locations. I work with teams in SF and Seattle. A physical board is a nice idea but just not possible with the way that we are distributed. Cons: I had some challenges with user management. I work in a large enterprise so adding users individually was a bit of a pain and it was challenge to move users from regular viewer to user or admin roles on multiple boards. I also found that bulk moves of cards was difficult. If I wanted to pick up several cards and put them between two existing rows that wasn't really possible without spending 8 or 10 minutes rearranging the other cards around it to keep the map coherent. Also our org runs on-prem JIRA and I had no way to connect JIRA and confluence together, which made it nearly impossible to keep the two in sync. This is ultimately why I stopped using the product. Overall: I was attempting to bootstrap some existing teams so that they could start doing more end to end thinking about their products as we were designing and building them. Pros: Gives product managers a great tool to create and manage product maps quickly and seemlessly. Cons: Creating a new map or a thread is a bit cumbersome, especially when swimlanes and columns have to be inserted or removed. Overall: Great experience. Some improvement needed. Also, it would be great if it can offer integration with Rally and other product management tools. easy to use and move cards around. Give you the same "feel" of using post-it notes. Export to PDF option is great! Cons: Free trial was only 30 days. Graphics aren't wild and crazy but serve the purpose. Overall: I used it to communicate a mission/story map of a partner integration. Outlined the high level steps at the top and then the detailed activities below. I used different color cards to represent different groups. I helped me get my point across! Thank you for your review! Let us know if you may need an extension of the trial! Overall: We use cardboard to document our story mapping sessions with business, ux and tech and then slice them into journeys to start breaking up stories and get better estimations for the work ahead of us. Pros: I love the ease of adding cards up on the board and the software. Helps with project management.